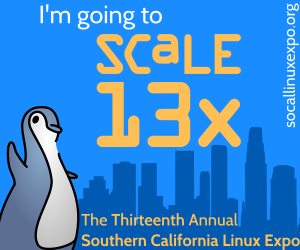 I'll be at SCALE 13x! With SCALE 13x fast approaching we wanted to help everyone let the Internet at large know that they'll be at the show. We've created a series of web badges that can be displayed on your personal website, Twitter account, Facebook page or anywhere else online letting your friends and followers know you'll be attending or speaking at SCALE 13x. Looking forward to seeing everyone at SCALE 13X!